← Kids Eat Hong Kong: Brunch with the babes this October! 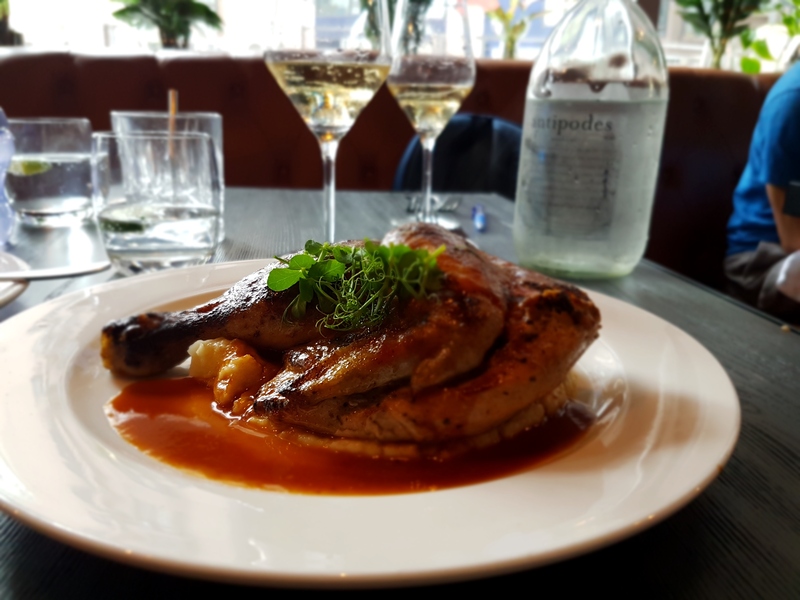 Previously known as The Blue Butcher, the revamped Blue – Butcher & Meat Specialist on Hollywood Road is a surprisingly good choice for families. I say “surprisingly” as, on first glance, this rebooted restaurant does come across as a bit too cool for the school-aged – all industrial-chic decor, neon signs and a glass-fronted meat room (that we nicknamed “The Kill Room”), giving you a birds-eye view of resident butcher Jonny Farrell prepping slabs of beef as you climb to the first floor. Stairs aside, this place is huge, and so there’s plenty of room to manoeuvre. 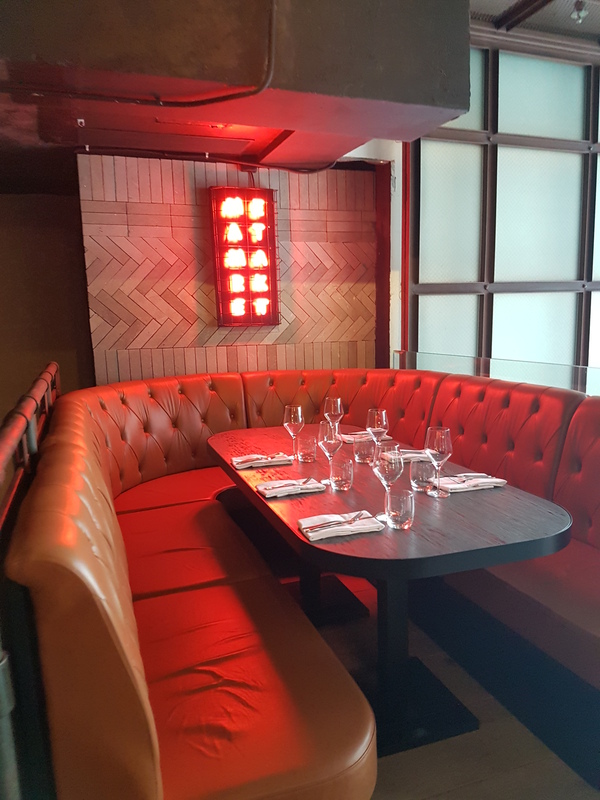 One side of the restaurant is lined with a long leather banquette, which is great for containing wriggly kids. There’s booster seats for little ones and I’m happy to report that these were squeaky clean. The service here is warm, on the ball and genuinely friendly. Our waiter engaged with the kids throughout the meal (frankly, even I don’t do that) and kept our glasses topped up throughout, which renders him a hero in my book. 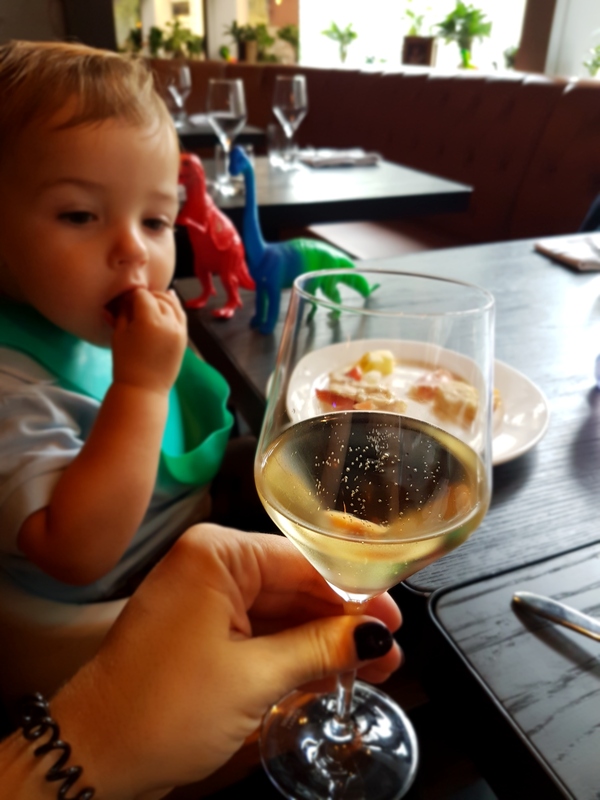 Speaking of which, if you can divert the kids long enough to make the most of it, it’s well worth adding the two-hour free-flow option – including Laurent Perrier champagne, cocktails, wine and beer – to your brunch. Because parenting is always more fun with booze. 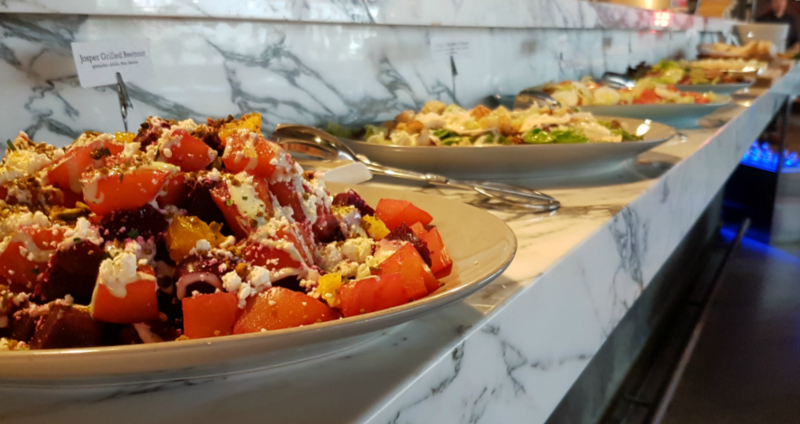 The Blue brunch is a semi-buffet concept – help yourself from the huge selection of salads, cheese and cold cuts, order your mains separately, then go nuts at the dessert station. This pretty much guarantees that you’ll be able to find something that even the pickiest kid will deign to eat. This format also swerves that nerve-wracking wait between ordering their food arriving – how hungry are they? How to stop them eating the entire bread basket? Will they remain calm until lunch arrives or will they start flinging cutlery around the room so that you have to leave in disgrace to go and angrily eat a McDonalds instead? Buffet starters FTW. While Mr T-T and I enjoyed lemon-poached shrimp from the seafood station, Master T-T rather uncharacteristically went to town on the grilled beetroot, pistachio and feta salad and the compressed watermelon with tomato slices (he’d been promised free-reign on crepes in return for eating plenty of veg – don’t judge my TERRIBLE parenting skills). Meanwhile, Baby T-T reverted to type, demolishing bread and cheese by the fistful until the mains arrived. 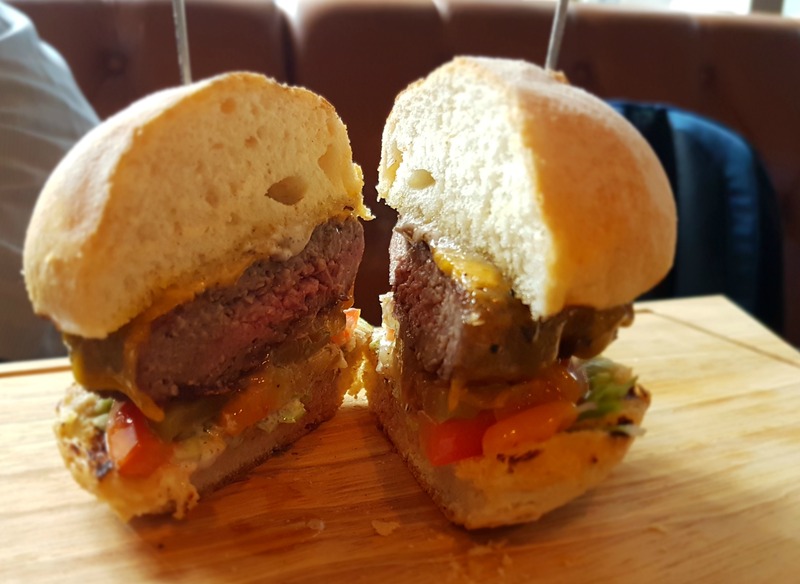 Deciding that three mains between the four of us was more than enough, we tried the 45 Day Dry-Aged Butcher’s Burger – a signature dish that we found incredibly tender, with an intense, earthy flavour, accompanied by wonderfully crisp fries. Next was the Half French Organic Free Range Chicken, served with potato purée and grilled peppers. The chicken was moist, with a sticky jus (actually more of a BBQ sauce) over the top, however I would have preferred this a little more seasoned, though I’m willing to admit that I tend to go pretty heavy on the salt so this may just have been me. 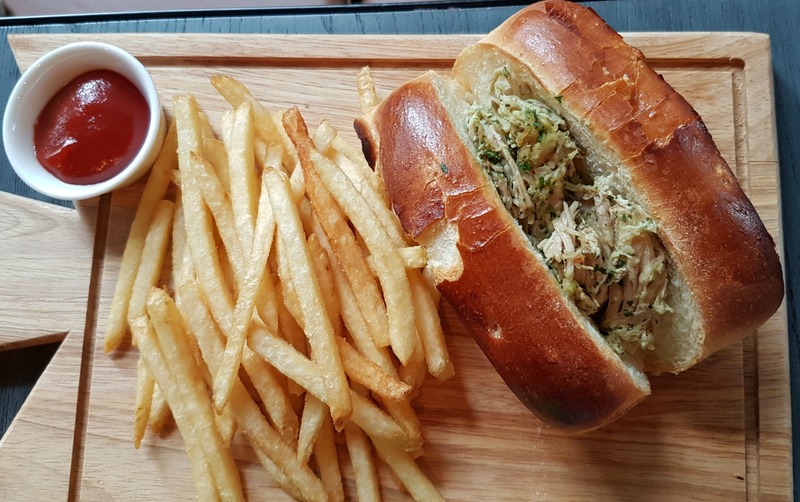 Last but not least was the Spanish Suckling Pig Roll in a Brioche Bun. Master T-T demolished this so quickly that I had to wrestle it from his hands to grab a bite, but I can confirm that this was full of flavour without being too fatty, which is an issue I often have with pork . 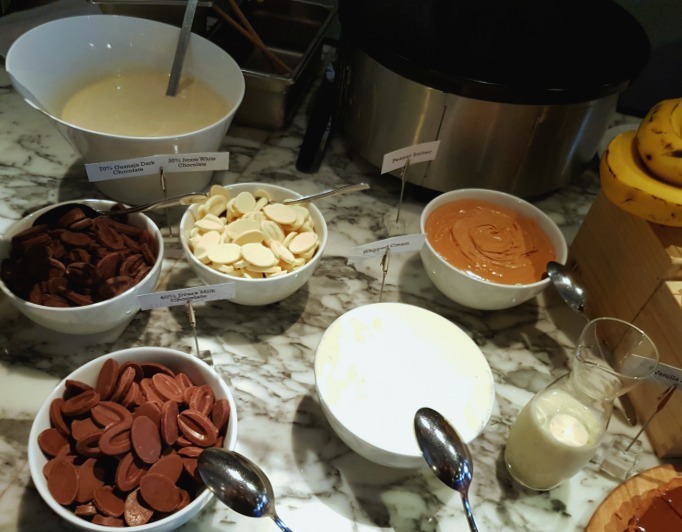 Promises are promises, and it was time to hit the dessert station for some freshly made crepes, which Master T-T was delighted to stuff with berries, chocolate and cream – some of which even made it into his mouth rather than down his t-shirt. 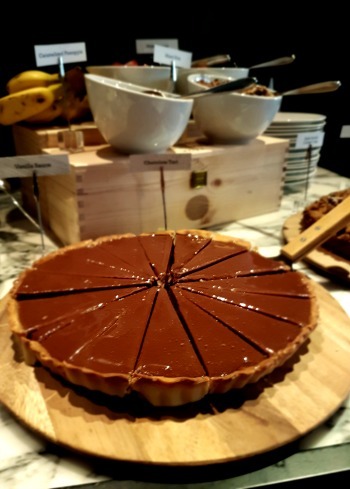 My food radar had already locked on to the chocolate tart – a ganache-filled, crisp-pastried wonder of a pud, so rich that I was unable to manage a second slice. I am still very sad about this fact. Blue hosts live music performances during Sunday brunch, which was a nice touch. I’m often a bit dubious about live music in restaurants as it can overwhelm conversation if it’s too loud (looking at you, Harlan’s, though tbf music was the least of our issues there), but this was just the right volume to chat while enabling me to pretend I couldn’t hear the demands for more crepes. Perfect. Yes, I said dinosaurs. Everyone likes dinosaurs, and the revamped Blue has quite the army of prehistoric pals, all decked out in neon colours. 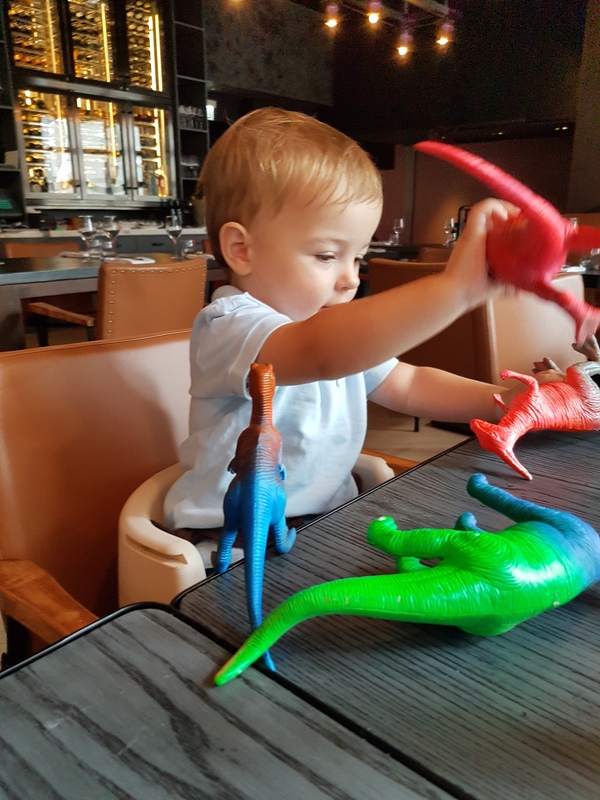 While I appreciate that these are predominantly for decorative purposes, we arrived just as a hungry Baby T-T was about to kick off MASSIVELY, something that our awesome waiter spotted and headed off at the pass by dumping an avalanche of dinos on our table. These buddies kept everyone busy for the entire lunch – at one point all four of us were engaged in a Stegosaurus vs T-Rex battle to the death – and there was quite a bit of coaxing required to return them all to their leafy home on the windowsill as we left. 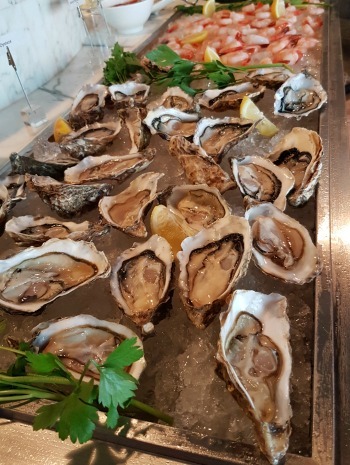 Blue’s brunch weighs in at a very reasonable $390 per person, with kids under 10 eating for free. (Spend their share on the $290 free-flow add-on, obvs). Yep, there’s stairs, so you’ll need to fold your stroller, and there’s also no baby change facilities here (although the bathroom is easily large enough to improvise), but this brunch sits firmly in the “places that adults actually want to eat” category, which is always a bonus if you’re tired of plastic cutlery. Give it a go. Brunch available weekends from 11am-3pm. Costs: $390 per adult, kids under 10 eat free, $290 for free-flow. Please note that our brunch was by invitation – thanks for having us, Maximal Concepts!